Probably the nation’s favourite annual! These beautifully scented blooms climb up trellis, are wonderful cut flowers and so easy to grow. We know the sweet pea has a special place amongst our gardeners’ affections and we’re delighted to offer a huge range of varieties to you. Nothing can beat the sweet pea for all round performance – garden decoration and wonderful fragrance in the garden and the vase! 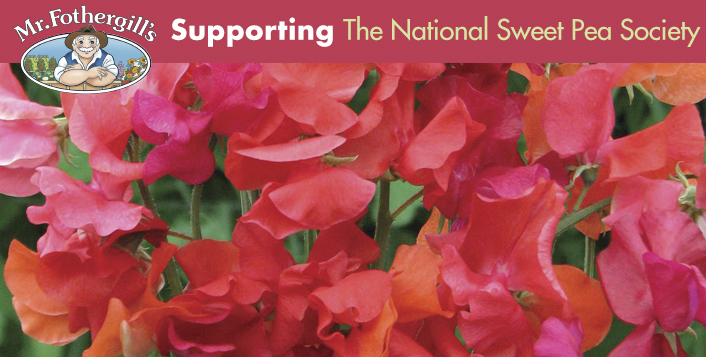 Mr Fothergill’s is pleased to be supporting The National Sweet Pea Society and is offering all new NSPS members enrolling in 2016 a £10 Mr Fothergill’s Gift Voucher to use from our latest catalogue. 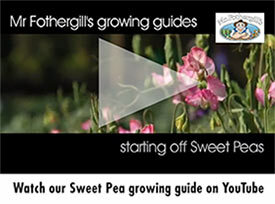 With over 70 different sweet peas in our latest catalogue, you’re sure to find something of interest! The NSPS was founded in 1900 and is a registered charity. It was set up to disseminate knowledge of Sweet Peas and other Lathyrus species, to encourage, improve and extend the cultivation of these flowers by means of scientific trials, the holding of exhibitions and displays, by publication and other activities.